In order to facilitate the identification of genes involved in the metastatic phenotype we have previously developed a pair of cell lines from the human breast carcinoma cell line MDA-MB-435, which have diametrically opposite metastatic potential in athymic mice. Differential display analysis of this model previously identified a novel gene, DRIM (down regulated in metastasis), the decreased expression of which correlated with metastatic capability. DRIM encodes a protein comprising 2785 amino acids with significant homology to a protein in yeast and C. elegans, but little else is currently known about its function or pattern of expression. In a detailed analysis of the DRIM gene locus we quantitatively evaluated gene dosage and the expression of DRIM transcripts in a panel of breast cell lines of known metastatic phenotype. Fluorescent in situ hybridization (FISH) analyses mapped a single DRIM gene locus to human chromosome 12q23~24, a region of conserved synteny to mouse chromosome 10. We confirmed higher expression of DRIM mRNA in the non-metastatic MDA-MB-435 clone NM2C5, relative to its metastatic counterpart M4A4, but this appeared to be due to the presence of an extra copy of the DRIM gene in the cell line's genome. The other non-metastatic cell lines in the series (T47D MCF-7, SK-BR-3 and ZR-75-1) contained either 3 or 4 chromosomal copies of DRIM gene. However, the expression level of DRIM mRNA in M4A4 was found to be 2–4 fold higher than in unrelated breast cells of non-metastatic phenotype. Whilst DRIM expression is decreased in metastatic M4A4 cells relative to its non-metastatic isogenic counterpart, neither DRIM gene dosage nor DRIM mRNA levels correlated with metastatic propensity in a series of human breast tumor cell lines examined. Collectively, these findings indicate that the expression pattern of the DRIM gene in relation to the pathogenesis of breast tumor metastasis is more complex than previously recognized. Breast cancer is a major cause of mortality among women worldwide . While curative measures are possible if the cancer is detected early and remains localized, many patients will succumb to advanced disease as the primary tumor metastasizes to secondary organs. Significant progress continues to be made in detecting and treating breast primary cancer but the ability to predict the metastatic behavior of a patient's tumor and to eradicate or control recurrent disseminated malignancy remain major clinical challenges in oncology. Knowledge of the molecular mechanisms involved in metastatic spread is needed to facilitate clinical advances and thus, a greater understanding of genes and gene products involved in breast cancer metastasis is an important research goal. In order to facilitate the identification of genes involved in the metastatic phenotype we have previously developed a well-defined experimental system, in which the role of candidate genes can be screened and tested. Through in vivo selection of monoclonal cultures of the MDA-MB-435 breast tumor cell line we were able to identify and characterize a pair of subclones (M4A4 and NM2C5) which differ in their ability to complete the metastatic process . When orthotopically inoculated into athymic mice, both cell lines form primary tumors, but only M4A4 is capable of metastasis to the lungs and lymph nodes [2, 3]. These cell lines constitute a stable and accessible model for the identification of genes involved in the process of tumor metastasis. The model has been subjected to multiple molecular profiling and gene expression analyses. The application of a differential display technique identified a novel transcript as being relatively over-expressed in the non-metastatic NM2C5 cell line. The candidate gene was cloned and sequenced, and the gene was subsequently named DRIM (down regulated in metastasis) . The DRIM gene encodes a protein comprising 2785 amino acids with significant homology to a protein in S. cerevisiae and C. elegans. The protein contains a conserved positively charged tail and several hydrophobic regions explained by the presence of HEAT repeats, 40 aa polypeptide stretches which form helix-loop-helix structures . The expression of DRIM has been investigated in several normal tissues and tumor cell lines , but little is known about the structure or function of the gene, or its relation to breast cancer progression. The aim of this work was to define the chromosomal location of the DRIM gene and to investigate the interrelationship between DRIM expression, and the cytogenetic and metastatic phenotype of a panel of human breast tumor cell lines. Cytogenetic analyses located the DRIM gene as a single copy on human chromosome 12q23~24. Fluorescent in situ hybridization (FISH) revealed that the higher expression of DRIM observed in the non-metastatic NM2C5 breast cell line, relative to its metastatic counterpart M4A4, is due to the presence of 3 and 2 copies of the DRIM gene in the genome of these cell lines respectively. However, when the relationship between DRIM gene dosage and mRNA levels was extended to the evaluation of a series of breast tumor cell lines, the expression pattern of the DRIM gene in relation to the pathogenesis of breast tumor metastasis appeared to be more complex than previously reported. The chromosomal localization of the human DRIM locus was clarified and refined by FISH using metaphase spreads obtained from normal human peripheral blood leukocytes, and a combination probe composed of two human DRIM genomic clones. Signals were considered specific only if they were detected on both chromatids of a single chromosome. Applying this criteria, specific DRIM signals were detected in 18 of 20 metaphases examined (90%), and in each case, the hybridization signals were located on the long arm of chromosome 12 (Figure 1). A combination of DAPI and R-banding of chromosomes enabled the assignment of the DRIM locus to 12q23~24. The localization of DRIM on chromosome 12 was further confirmed by two-color FISH using both the DRIM probe and a chromosome 12-specific paint (data not shown). No DRIM signals were detected on any other chromosome. This chromosomal location is consistent with information available from the NCBI Map View database http://www.ncbi.nlm.nih.gov/mapview/map_search.cgr which places DRIM at 12q23 between markers D12S346-D12S78. The location is also consistent with the localization of the 156 bp STS G3 1980 (Sanger Center's GB4 radiation hybrid RH65919) which shows 100% homology to DRIM and has been placed 689.3 cR from the top of chromosome 12 (Figure 2). 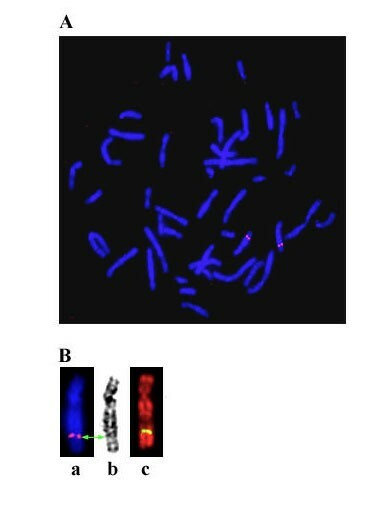 (A) genomic chromosomal localization of the human DRIM by fluorescence in situ hybridization. Metaphase spread counterstained with DAPI and hybridized with a DRIM genomic DNA probe (red) demonstrating DRIM-specific signals on the long arm of chromosome 12. (B) additional images of chromosome 12 showing DRIM localization at 12q23~24. (a) counterstained with DAPI (DRIM-specific signal in red)., (b) an image of reverse-DAPI banding., and (c) an R-banded chromosome (DRIM-specific signal in yellow). The DRIM gene was discovered through differential display analysis of the MDA-MB-435 subclones M4A4 and NM2C5 . In order to investigate whether gene copy number was a factor in this differential expression, the karyotypes of these two cell lines were compared using G-banding in combination with Spectral karyotyping (SKY) analyses. In particular, the complement and the integrity of chromosome 12 material was evaluated. Spectral karyotyping  is a multi-color FISH procedure capable of classifying all chromosomes in a single hybridization experiment. Using this technique it was revealed that both the metastatic M4A4, and the non-metastatic NM2C5 cell lines are hyperdiploid (modal number of 56–57) and contain multiple chromosomal aberrations (Figure 3). A number of signature markers were common to both lines (Figure 3) and were present in all metaphase spreads analyzed for each cell line. Detailed comparisons of multiple images allowed clarification of almost all marker chromosomes in these two cell lines. Both cell lines contained 2 copies of apparently normal chromosome 12. However, one specific chromosomal rearrangement, found only in the non-metastatic cell line NM2C5, consisted of a non-reciprocal translocation involving chromosome 12 material (Figure 2). This (12;15) translocation occurred in 100% of NM2C5 cells examined, but was never present in M4A4. Confirmatory FISH and G-banding evaluations identified this translocation as t(12;15)(q22;q26.1). No other chromosomal rearrangements were found to be specific to the NM2C5 cell line. FISH analysis revealed that the extra chromosome 12 material present in NM2C5 cells was composed of 12q sequences including a third copy of the DRIM locus (Figure 3). Further analysis revealed that in 40% of M4A4 cells there was a deletion in the p-arm of one chromosome 12. However, this would not affect the DRIM gene located on the q-arm, which appeared normal in all cases. DRIM-specific FISH analyses confirmed that M4A4 cells contain only 2 DRIM loci located on 2 normal chromosomes 12 (Figure 4). 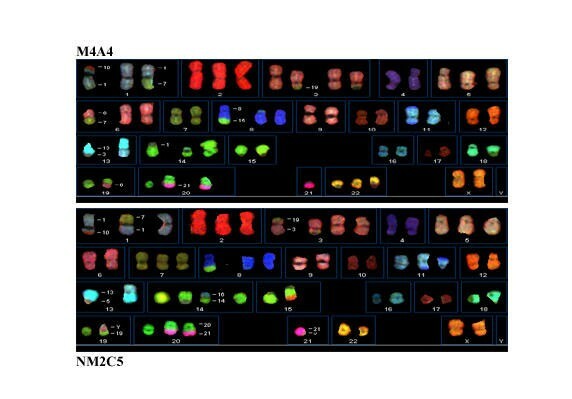 Spectral karyotyping (SKY) classification of representative metaphases of MDA-MB-435 subclones M4A4 (upper panel) and NM2C5 (lower panel). Chromosome material involved in translocations are indicated on the figure in some cases. Each cell line has 2 normal chromosome 12's. 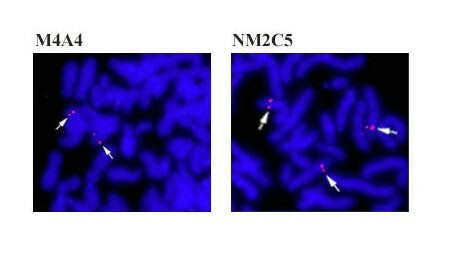 NM2C5 cells contain a marker chromosome consisting of material from chromosomes 12 and 15 (see chromosome 15 box, lower panel). Localization of DRIM in the genome of MDA-MB-435 breast tumor cell line clones. Partial metaphase spreads hybridized with the DRIM probe (pink) and counterstained with DAPI (blue). The non-metastatic NM2C5 clone carries 3 copies of the DRIM gene; the metastatic M4A4 clone contains only 2 copies. The copy number of DRIM loci and the integrity of chromosome 12 material was evaluated in a panel of 6 human breast tumor cell lines commonly used in research, and whose metastatic propensity in athymic mice is documented. The 3 MDA breast cell lines, MDA-MB-231, MDA-MB-468 and MDA-MB-435 (the parental line of NM2C5 and M4A4) have all been described as metastatic to varying degrees [7, 8]. Orthotopic inoculation of these cell lines results in dissemination and secondary growth primarily in the lungs and lymph nodes [2, 8]. MDA-MB-231 and MDA-MB-435 have also been shown to be capable of metastasis to the lungs if injected into the left side of the heart [9, 10]. Conversely, the breast cell lines SK-BR-3, ZR-75-1, T47D and MCF7 are reportedly non-metastatic in athymic mice [11–14]. DRIM-specific FISH analysis revealed that cell lines SK-BR-3, T47-D and MCF-7 contained an average of four copies of the DRIM gene. In each case there were two normal chromosome 12's in each cell, as well as one or two unidentified markers that contained DRIM-inclusive 12q material. Occasional cells of SK-BR-3 and MCF-7 contained a deletion in the chromosome 12 q-arm telomeric of the DRIM locus. MDA-MB-231 cell populations appeared to contain at least three sublines with regard to DRIM gene copy number. Relatively equal subsets contained 2, 3 or 5 copies of the DRIM gene (average 3.3 copies) located on 2 normal chromosome 12's and on 1–3 unidentified marker chromosomes. 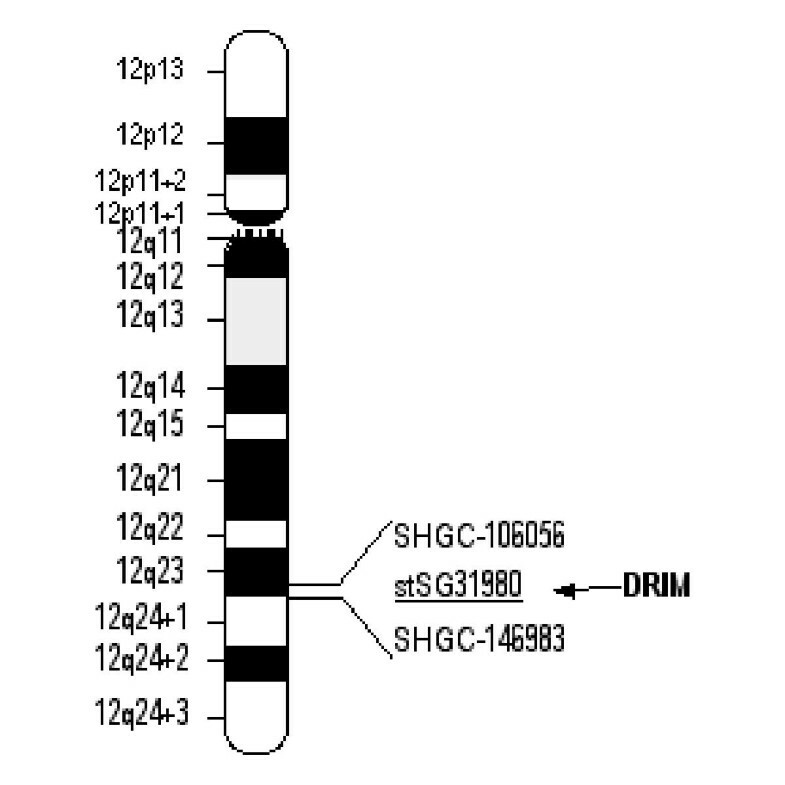 MDA-MB-468 cells contained two copies of DRIM residing on normal chromosome 12s. Triploid ZR75-1 cells contained three copies of DRIM on 3 normal chromosome 12's. DRIM mRNA levels were quantitated in NM2C5 and M4A4 cells using real time, RT-PCR analyses. Optimized RT-PCR amplification produced specific single bands for both DRIM and GAPDH. The relative level of mRNA expression in breast cancer cell lines was calculated on the basis of differences in normalized Ct values between samples. RNA transcripts encoding DRIM were most highly expressed, at a level equivalent to 2.9% to that of GAPDH transcript abundance, in the non-metastatic NM2C5 cell line. Relative to non-metastatic NM2C5 cells, DRIM expression was ~2-fold lower (56% of NM2C5) in metastatic M4A4 cells (Table 1). This finding confirms the reported differential DRIM expression between these two cell lines, a finding which led to the naming of this gene . To further evaluate the level of DRIM expression with regard to metastatic phenotype, real-time RT-PCR was used to quantify DRIM mRNA expression in cDNA preparations obtained from the panel of 6 human breast tumor cell lines described above. The expression of DRIM mRNA was detected in all breast tumor cell lines tested. Table 1 shows cell line DRIM mRNA determinations as a percentage of levels of the high expressor NM2C5 cell line. Regardless of known metastatic propensity, relatively low levels (ranging from 8% to 25% of NM2C5 cells) were detected in each of the remaining breast tumor cell lines. Our study refined the localization of the DRIM gene locus to chromosome 12q23~24 by genomic clone hybridization, and used this information and reagents to evaluate the relationship between DRIM gene copy number, DRIM gene expression levels, and the metastatic phenotype of a panel of human breast tumor cell lines. The mouse homolog of DRIM has recently been reported as being located at mouse chromosome 10 C1 (Reference sequence NM175158) within a region of conserved synteny. The DRIM gene was also one of a panel of specific human genome loci used to evaluate synteny between human chromosome 12 and pig chromosome 5 . There have been many attempts to identify specific chromosome abnormalities associated with breast cancer. Kytola et al used a combination of SKY and CGH to analyze several breast cell lines and reported that chromosomes 1, 8, 16, 17 and 20 were most frequently involved in unbalanced translocation events . Morris et al also used multifluor hybridization to karyotype 3 breast cell lines and reported common gains of 8q and 12p as the most common features . Loss or gain of chromosome 12 material in cancer is relatively rare according to accumulated comparative genomic hybridization (CGH) data. Gains of 12q have been reported in lung, bladder, colorectal, nasopharyngeal and adrenocortical carcinomas  and there is some evidence from CGH studies of 12q involvement in breast cancer. Loss of 12q material was evident in 3 metastases , several invasive ductal carcinomas  and in BRCA1 mutation carriers . However, overall more gains of 12q have been reported in cases of invasive ductal carcinomas [19, 22–24]. Thus, whether loss or gain of 12q material is involved in breast tumor progression requires further studies on increased numbers of human cases. To date, the only reported specific involvement of chromosome 12 in clinical cancer progression is that of trisomy 12 being characteristic of subtypes of ductal breast carcinoma and possibly related with an advanced stage of disease . A search of the Online Mendelian Inheritance in Man Database http://www3.ncbi.nlm.nih.gov/Omim/ did reveal the presence of two non-cancerous human disease loci in the vicinity of the DRIM gene. High-grade myopia (MYP3; 12q21-q23) and nonsyndromic sensorineural deafness 25 (DFNA25; 12q21-q24) have been mapped to human chromosome 12. Whether DRIM plays any role in the aforementioned diseases is currently unclear. To investigate possible associations of DRIM with known mouse mutants, the Mouse Genome Database http://www.informatics.jax.org was searched for aberrant mouse phenotypes that are located in close proximity of the DRIM locus. No phenotypic associations were found to be associated with the vicinity of the mouse DRIM locus. Previous evaluation of DRIM expression was able to detect its presence in a number of tissue types and in cell lines of varied origin using Northern blot techniques. The relatively large size of the processed DRIM transcript (10 kb) and its low to medium abundance make Northern blotting analyses difficult and no attempt was made to quantitate the expression levels relative to an internal control in the earlier study . Here, it was important to obtain accurate expression data in order to correlate transcript levels with gene copy number. Using real time, quantitative PCR we have demonstrated that a wide sampling of human breast tumor cells of epithelial origin synthesize appreciable levels of DRIM transcripts. However, whilst the increased expression of DRIM transcripts in NM2C5 cells relative to M4A4 may be due to DRIM gene copy number, no correlation was found between the detected number of DRIM gene loci in a cell population and DRIM mRNA expression across all cell lines examined. Cell lines with 4 copies of the DRIM gene (SK-BR-3, MCF7, T47D) had only ~25% of NM2C5 DRIM transcript levels and half of that expressed by M4A4 cells, even though these cell lines had double the copies of DRIM within their genome. Most importantly, there appeared to be no correlation between DRIM expression levels and metastatic phenotype. The levels of DRIM mRNA were significantly lower than those found in M4A4 in all of the non-metastatic cell lines. Furthermore, the most weakly metastatic of the cell lines capable of spontaneous metastasis (MDA-MB-468) had the lowest DRIM expression levels. In this context, we also compared DRIM expression in another metastatic clone, in this case derived from the M4A4 cell line. By serial passage through mice i.e. recovery and reculturing of a M4A4 lung metastasis, we have previously selected a subclone which is more aggressively metastatic than its parental M4A4 cell line. Whereas M4A4 is metastatic to the lungs of ~75% of inoculated animals , The Lung Metastasis Clone 3 (LM3) cell line is metastatic in 100% of inoculated athymic mice and the metastatic load (metastases per lung) is also increased. We had hypothesized that analysis of this cell line may reveal a dose-effect of DRIM expression. A more aggressively metastatic cell line would be expected to have a further reduced DRIM expression index. However, cytogenetic analysis of the LM3 cell line revealed that it has an identical chromosome complement to M4A4, and DRIM transcript levels were found to be at a similar level to those detected in M4A4 cells at 63% of non-metastatic NM2C5 cell levels. The absence of estrogen receptors (ER) in breast tumor cells is indicative of a more dedifferentiated, more invasive and advanced tumor state . In line with this, the non-metastatic cell lines in the test panel (SK-BR-3, MCF7, and ZR-75-1) are all ER-positive. Conversely, those that are known to be capable of metastasis (MDA-MB-435, 231 and 468) are ER-negative. The non-metastatic NM2C5 subclone appears to be an exception to this rule. There was no correlation of DRIM expression with estrogen receptor status in the breast cancer cell line panel. There has been some recent discussion regarding the origin of MDA-MB-435 cells. A study, which used microarrays to profile and cluster NCI-repository cell lines of various origins, found that breast tumor cell lines did not align well with each other . Breast tumor cell lines clustered with cell lines of unrelated tissue origin e.g. MDA-MB-435 aligned most closely to a cluster of melanoma cell lines. A subsequent article evaluated the presence of a few supposed breast and melanoma-specific genes in a panel of tumor cell lines  and also found that there is considerable overlap regarding expression of 'tissue-specific' genes in cultured cell lines. Whilst we are currently investigating this issue through multiple evaluations, we thought it pertinent here to evaluate DRIM expression in some melanoma cell line series of known metastatic phenotype. A375P, A375M and A375SM cells are human melanoma cell lines of increasingly aggressive metastatic phenotype . Analysis revealed no change in DRIM expression across these cells of differing metastatic potential. Human C8161 melanoma cells are of proven metastatic phenotype  but had higher DRIM transcript expression levels than many of the non-metastatic breast cell lines used in this study. The data accumulated thus far suggests that the loss of DRIM expression is a cell line-specific phenomenon rather than being cancer-specific. Although widespread in tissue distribution , little is currently known about the function of the DRIM protein. The absence of a signal sequence suggests an intracellular localization, and an indication of function comes from the presence of multiple HEAT repeats. These are tandemly repeated peptide motifs of 40–50 residues which form alpha-helical structures and which can in turn pack together to make superhelices . The HEAT repeat is evolutionarily related to the armadillo (ARM) peptide motif, but was named after the proteins in which these tandem arrays were first identified; huntingtin, EF3, PP2A and TOR . A function common to many of the ARM and HEAT-repeat proteins is that of mediating important protein-protein interactions. Members of the HEAT-repeat proteins include beta-catenin and the importins: beta-catenin binds to the conserved cytoplasmic domain of cadherins , and importins recognize cytosolic proteins bearing a basic nuclear localization signal (NLS), and facilitate nuclear import . A search of genome databases using the DRIM nucleotide sequence reveals closest homology to the yeast protein YBA4 (SwissProt P35194), which also contains 4 HEAT repeats. Recent evidence supports the idea that DRIM and its yeast homolog protein have a function in protein-protein interactions and nuclear import. Firstly, DRIM was one of many proteins identified by mass spectrometry as part of a functional proteomic analysis of the human nucleolus . Secondly, the Biomolecular Interaction Network Database (BIND)  describes multiple YBA4 protein binding partners, the majority of which are known to be localized to the nucleolus and which are part of nucleolar, ribosomal RNA processome complexes. Information is accumulating with regard to the cellular and tissue distribution of DRIM, and to the putative function of this gene. Using a combination of cytogenetic and molecular assays we have clarified and refined the chromosomal location of the human DRIM gene and investigated the spectrum of DRIM gene expression across a panel of cell lines derived from human breast carcinomas. We evaluated the interrelationship between DRIM gene copy number, DRIM transcript expression, and metastatic phenotype. The number of DRIM gene loci present in the genome does not necessarily correlate with DRIM mRNA levels in breast tumor cell lines. Furthermore, DRIM mRNA levels do not correlate with the ability of breast tumor cell lines to metastasize, at least in athymic mice, and so whether DRIM plays any role in metastatic phenotype remains unclear. Based on this information the DRIM gene and its products are not promising markers for the evaluation of primary tumors for metastatic propensity. Although the DRIM gene has been further characterized in this study, continued investigation into the function of this interesting gene is required to determine what, if any, role DRIM plays in breast tumorigenesis and proliferation. Human mammary tumor cell lines MCF-7, T47D, SK-BR-3, and ZR-75-1 were obtained from the American Type Culture Collection (ATCC, Manassas, VA). MDA-MB-435, MDA-MB-468 and MDA-MB-231 were kindly provided by Dr Janet Price of the Department of Cancer Biology, M.D. Anderson Cancer Center, University of Texas. MDA-MB-435 subclones M4A4 and NM2C5 have been described previously . Cell lines were maintained as subconfluent monolayer cultures in RPMI 1640 or DMEM medium (Gibco-BRL, New York, NY) supplemented with 10% fetal calf serum at 37°C under 5% CO2 /95% air. The medium was exchanged every third day, and passaging was routinely performed as cultures reached ~75% confluency. Chromosome preparations were obtained from phytohemagglutinin (PHA)-stimulated human peripheral blood lymphocytes cultured at 37°C for 72 h. To induce R-banding some cultures were incubated with 5-Bromodeoxyuridine (60 μg/ml of culture medium) for the final 7 h of culture. Metaphase spreads were obtained from tumor cell lines treated with colcemid (0.3 μg/ml final concentration) for 2–5 hours prior to harvest. Cytogenetic harvests and slide preparations were performed using standard protocols. Slides were aged overnight at RT and stored at -80°C until use. The DRIM PAC library genomic clones (equimolar pooled combination of DRA1 and DRA4) were nick translated using Biotin-14 dATP and Biotin-14 dCTP (Gibco BRL) and hybridized to metaphase spreads as described previously [36, 37]. Briefly, the prepared probes (200 ng) were dissolved in hybridization buffer with 10 μg of COT-1 DNA, applied to the slide under a coverslip, and strand separation achieved on a slide warmer at 75°C for 5 min. Hybridization was performed overnight at 37°C, and slides were washed once in 50% formamide/2X SSC at 37°C for 15 min, followed by a second wash of 2X SSC at 37°C, for 8 min. Biotin-labeled probe detection was accomplished by incubation with a FITC-avidin conjugate (Vector Laboratories). Chromosomes were counterstained with propidium iodide or DAPI diluted in Prolong anti-fade solution (Molecular Probes, Eugene, OR). The slides were observed with a 100X objective on a Zeiss Axiophot microscope equipped with a xenon vapor lamp and a triple-band-pass filter (Chroma, Battleboro, VT). All cytogenetic analyses include data from at least 20 fully analyzed metaphase cells. Metaphase cells were prepared by standard cytogenetic methods. Glass slides were baked at 65°C for 48 h prior to incubation in trypsin for approximately 45 sec and rinsing in 70% and 95% ethanol. Slides were then placed in Gurr's buffer (BioWhittaker, Walkersville, MD) for 1 min before treatment with Wright's stain. Slides were mounted with Prolong Antifade solution (Molecular Probes, Eugene, OR) and analyzed on a Zeiss Axiophot microscope with a 63X objective. Monochrome photographs were analyzed using standard nomenclature as designated by the ISCN. Metaphase chromosome preparations were made from exponentially growing cultures using standard procedures. SkyPaint probe hybridization and image capture/analysis [38, 39] were performed according to manufacturers instructions (Applied Spectral Imaging, Carlsbad, CA). Probes are created using purified, single chromosome templates and PCR amplified using degenerate oligo-primers and incorporating 3 fluorochromes and 2 haptens. The specific combination of these 5 labels results in a unique spectral signature for each chromosome. Indirect detection of haptens was performed using Cy5 conjugated avidin and Cy5.5 conjugated anti-mouse IgG (Rockland, Gilbertsville, PA). Slides were counterstained with DAPI and mounted with Prolong anti-fade solution (Molecular probes, Eugene, OR). Spectral imaging was achieved using a SpectraCube system (Applied Spectral Imaging) mounted on a Zeiss Axiophot microscope, viewed through a 63x oil-immersion plan apo objective illuminated by a xenon lamp (Opti Quip, Highland Mills, NY). Chromosome classification was performed with SkyView software (Applied Spectral Imaging). DAPI banding was captured separately and inverted for alignment with spectral representations using SkyView software. Total RNA was extracted from exponentially growing cell line cultures using the RNeasy kit (Qiagen, Valencia, CA), treated with DNase I, and reverse transcribed using MMLV reverse transcriptase with a combination of oligo (dT) and random primers (Ambion, Austin, TX). The resulting cDNA was used as a template for quantitative PCR using gene specific primers. Real time, quantitative PCR was performed on an Applied Biosystem PRISM 7700 Sequence Detection System using SYBR Green® I chemistry (PE Applied Biosystems (PE-ABI), Foster City, CA) as described previously . Briefly, PCR was performed using the SYBR Green PCR Master Mix kit containing SYBR green I dye, AmpliTaq Gold DNA Polymerase, dNTPs with dUTP, passive reference and optimized buffer components (PE Applied Biosystems). PCR primers were designed to amplify the DRIM gene using Primer Express Version 1.5 software (PE Applied Biosystems) or MacVector software (Oxford Molecular, Beaverton, OR). Fifty ng of cDNA template was added to a reaction volume of 25 μl and all primers were used at a final concentration of 100 nM. No-template controls were included for each target. Thermocycling was initiated with a 10 min, 95°C enzyme activation step followed by 40 cycles of 95°C for 15 seconds, 60°C for 1 min. and 72°C for 1 min. All reactions were done in triplicate, and each reaction was gel-verified to contain a single product of the correct size. Data analysis was performed using the relative standard curve method as outlined by the manufacturer (PE Applied Biosystems) and as described previously . The mean GAPDH concentration (primer set supplied by PE Applied Biosystems) was determined for each cDNA sample and used to normalize expression of other genes tested in the same sample. The relative difference in expression was recorded as the ratio of normalized target concentrations for the same cDNA dilution. DRIM primer sequences: forward primer, 5'-CCTGGCATAGCAGAAACATCG; reverse primer, 5'-CTGGAAAGTCTCAAAGCGAACG. SG conceived of the study, participated in all experimentation, performed data analysis and wrote the manuscript. CV performed cytogenetic analyses and tissue culture. MG carried out the quantitative PCR analyses. VU participated in the design of the study, performed statistical analyses and aided SG in manuscript preparation. This work was supported in part by the California Cancer Research Program 570V-10189 (VU) and 753V-20121 (SG) and a Sidney Kimmel Scholar Award (SG).